Songs of the Untethered Soul expresses our inner longing to be free and the journey toward the awakening of consciousness. 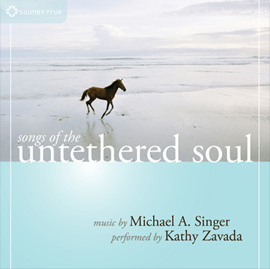 Michael Singer, composer and author of The Untethered Soul, is joined by vocalist Kathy Zavada to present eight inspirational selections meant to still the mind, open the heart, and welcome us into the arms of the Beloved. With vocals, piano, fretless bass, acoustic guitar, cello, and drums. Website ©2013 Shanti Publications, Inc.